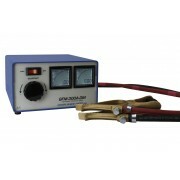 Ground Continuity Tester, 3-300A Output with Digital meters. 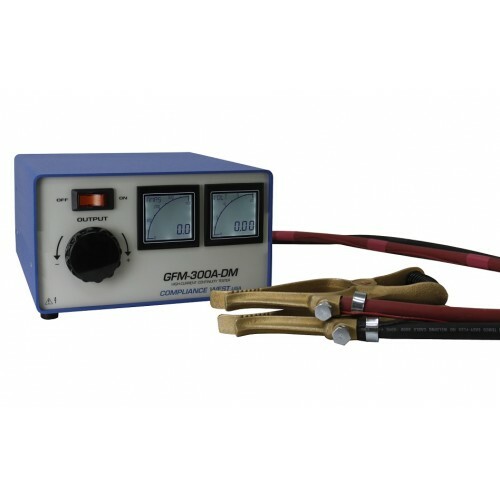 The GFM-300AC is designed for testing where very high currents are needed to judge connection resistance. The front panel allows adjustment of the AC current up to 300A with a max load of 0.010Ω. The dual digital meter front panel simultaneously displays both current through and voltage across the grounding circuit of the unit under test. Provided with premium leads and alligators, manual and calibration certificate. Built in the USA. Email and phone support free fr life. AC output - constant current delivers up to 300A at up to 3.75V for ground resistance measurements of up to .010 ohms. Current is adjustable from the front panel. Digital meters indicates output current and voltage. Output breaker switch on front panel. Large knob for easy adjustment. Calibrated to ANSI Z540 Standards.